Why do our fries taste so great? We make our french fries the old fashioned way — they are hand-cut and fried in 100% beef fat to maximize flavor, then tossed with our own blend of seasonings. We’ve got Asian, Southern, Tex Mex, and food-truck inspired bowls and healthy salads, so you have plenty to choose from. Better yet, you’ll leave with a full stomach and more money in your pocket. We’ve got free WiFi and outlets under each booth, so whether you need a place to study or work we can keep both you and your laptop fed. Stopped in tonight for the first time. Large family to go order. Staff was super accommodating and the food was great. We will be back! 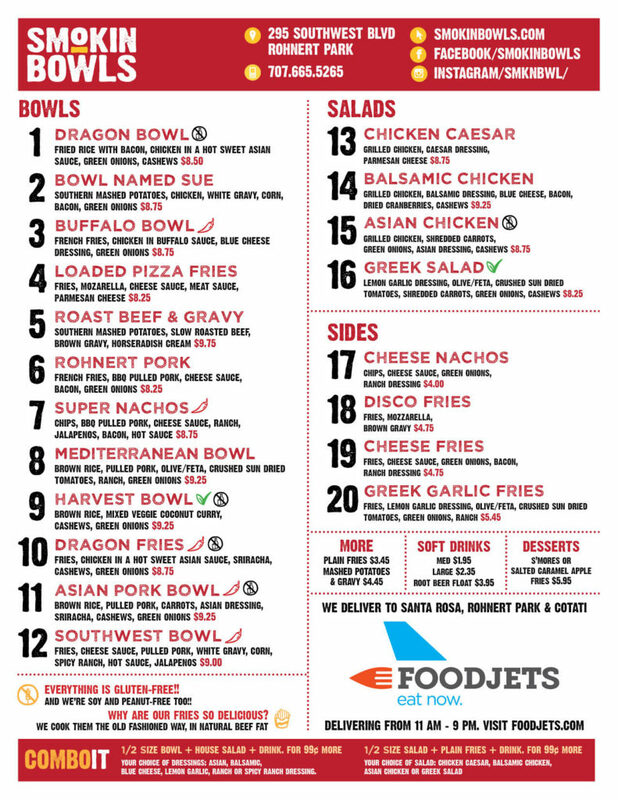 Dragon Bowl, Bowl Named Sue, Rohnert Bowl, and Cheese fries all fantastic! Thanks, Smokin’ Bowls! We now deliver through Foodjets. or click the logo below. Keep up with the latest Smokin' Bowls news!